The family invited us to stand a flag line at the interment service. After the Mission Briefing, four honor bikes will be identified and moved to the Staging Lane to accompany the procession. The remainder of the Riders will proceed to the designated Committal Shelter, establish the Flag Line and prepare to receive Mr. Ferguson’s family and friends. When directed, the Riders will return the flags to storage and then be debriefed and dismissed. 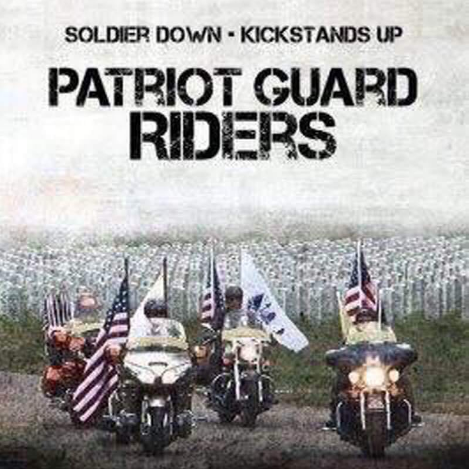 ***MISSION ACCOMPLISHED*** Today the Patriot Guard Riders honored the service of Mr. I.V. Ferguson, United States Army Korean War Veteran, as we Stood Tall and Silent during his interment service. The certificate of our appreciation was presented to the family at the Public Information Center prior to the funeral service. The procession to the Committal Shelter was led by Jack, Howard, Sue, Archie and Mark serving as honor bikes. Sue, Howard, Archie, Mark, Linda and Tom were given the honor of carrying Mr. Ferguson his last few steps. A very special thanks to Laura, who so tirelessly gets our Missions out to the Riders, to Dan for getting the Missions posted to the National website and as always, to Mike, who took the photographs, showing this family the true face of the Patriot Guard Riders, those who so willingly give of themselves and are found standing in the Flag Line. To Laurie, and all of Mr. Ferguson’s family and friends, thank you for allowing the Patriot Guard Riders to stand today in honor of this American Hero. May God comfort you in your loss.